Eating out in town is something that I always find tricky, particularly in my town where it all seems to be Italian restaurants. When looking at the menus we found that Prezzo offered gluten free pasta and pizza, much like Pizza Express and a couple of other restaurants we have visited. Neither of us had tried Prezzo before so we thought it would be a good place to go. For starters we had the antipasto, where James ate the bread and I had some of the meats and olives. For mains I chose the gorgonzola pasta. This consisted of roasted seasoned chicken, which is by far the best chicken I have eaten out. It reminded me of left over Sunday roast chicken I like to put in toasties or rice dishes. Pancetta was the second meat incorporated in the dish and was quite smokey and added depth to the flavour. Leek and broccoli created a freshness to the dish, this was all blended in a parsley and cream sauce. This dish is by far the the most original free from dish I have had out in a while. The ability to choose any pasta dish or pizza (except the meatballs) on the menu was quite refreshing, and left me quite overwhelmed with choice to be honest! The pasta, very much like all gluten free pasta I have found before, is almost identical to regular pasta which is fantastic. 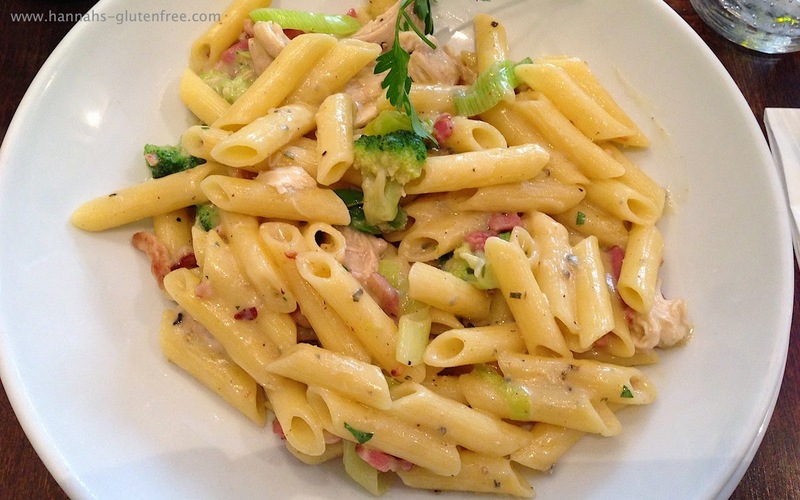 All pasta dishes that are asked for gluten free use penne pasta. This is something I actually prefer as if they offered all the varieties I would be nervous that they had not given me the right type which could leave me unwell. I really enjoyed the meal as a whole, the food is of high quality and the service and atmosphere was second to none. I found that on average it was £20 per head and portions were very large, so was fantastic value. If you visit Prezzo, I would love to know what you tried.